In New York, Alvin Sanders is a small-time thief who's just been hauled in for stealing a bunch of prawns (shrimp) from a local restaurant. He ends up in a cell with John Jaster, one half of a high-tech criminal team that's just stolen $42,000,000 worth of gold from the Federal Reserve. Realizing that he could die at any moment from his worsening heart condition, Jaster tells Alvin to relay a cryptic message to his wife about the whereabouts of the hidden gold. Alvin doesn't know exactly what the message means, and Edgar Clenteen, the U.S. Treasury investigator working the case, hopes it will lead to the gold or Jaster's partner Bristol, but it does neither. Eighteen months later, Jaster is dead, and both Clenteen and Bristol are still looking for that gold. Clenteen decides to secretly plant a tracking device in Alvin's jaw, release him from prison, and then let the word out that he knows where the gold is hidden. Knowing that Bristol is probably watching their every move, Clenteen hopes Alvin will act as the bait that'll lure Bristol in. 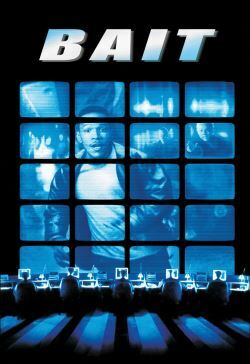 To the dismay of Clenteen and his colleagues, agents Wooly, Blum, Boyle, and Walsh, who are tracking Alvin's every word and move, Alvin immediately gets into trouble, although he decides to go straight once he learns that while he was in prison, his girlfriend Lisa Hill gave birth to their son. Even so, run-ins with his criminal brother, Stevie Sanders and Stevie's two partners, Ramundo and Julio, puts Alvin in danger of being locked up again, which threatens to mess up Clenteen's plan. What will happen when Alvin realizes that he's being used as bait to nail Bristol?